This tutorial has been tested on Windows 10 (64 bit), with CMake 3.13.1 and Visual Studio Community 2017. Visual Studio Community 2017 could be downloaded from https://www.visualstudio.com/downloads/. During a fresh installation enable "Universal Windows App Development Tools". Without this workload, you won't be able to create your universal apps. After a fresh installation, start Visual Studio and create an empty C++ project to install the common tools for Visual C++ 2017. 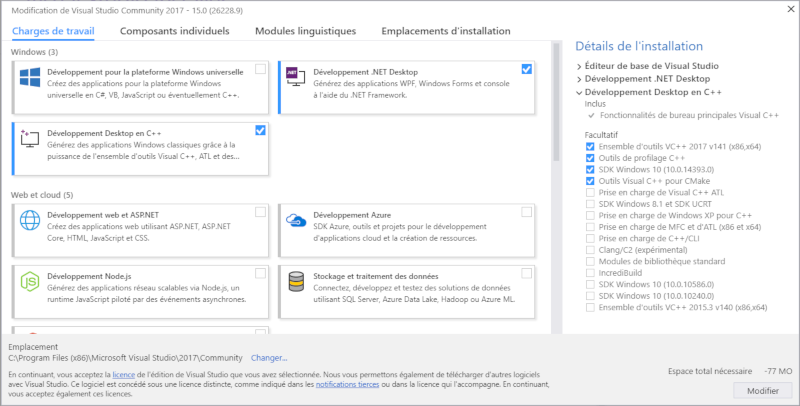 After Visual Studio installation, you need to enable your Windows 10 device for development. If everything goes right you will find ViSP libraries and headers in %VISP_WS%/visp-build-vc15-uwp-ws-10-install folder. Libraries are located in x86/vc15/bin subfolder and headers in include subfolder. An other way to build ViSP is to use Visual Studio. To this end open File Explorer, navigate to %VISP_WS%\visp-build-vc15-uwp-ws-10-x86 folder and just double click on VISP.sln solution file. This action will open ViSP solution in Visual Studio C++. 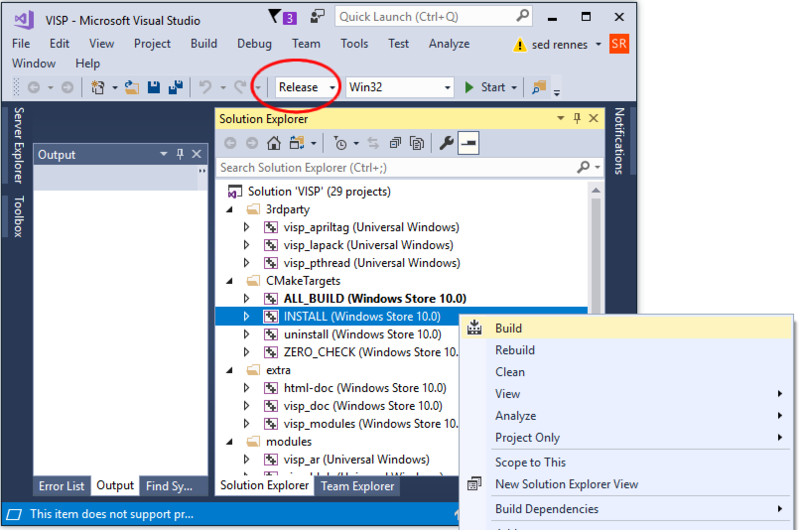 With Visual Studio to build and install the solution, select first "Release" configuration and build "INSTALL" project. To this end, in Visual Studio right panel apply a left click on "INSTALL" to select the project, then a right click to enter in the "Build" menu. If everything goes right you will find ViSP libraries and headers in %VISP_WS%/visp-build-vc15-uwp-ws-10-install folder. Libraries are located in x64/vc15/bin subfolder and headers in include subfolder. If everything goes right you will find ViSP libraries and headers in %VISP_WS%/visp-build-vc15-uwp-ws-10-install folder. Libraries are located in ARM/vc15/bin subfolder and headers in include subfolder. Follow Visual Studio installation instructions to activate "Universal Windows App Development" workload in order to resolve this issue.